The Bureau of Labor Statistics released its regular monthly report on employment this morning. The report indicates that the trends seen since late 2010 have continued, with steady but modest growth in private employment, falling government employment, and a resulting growth in total employment that brings down the unemployment rate only slowly and with month to month fluctuations. Total non-farm employment (from the Business Establishment Survey) rose by an estimated 157,000 in January, with private non-farm employment rising by 166,000 while government employment was cut by 9,000. The figures in this report also reflect the impact of the regular annual re-benchmarking of the employment statistics. As was discussed in an earlier posting on this blog, this re-benchmarking was expected to raise the estimates for employment in 2012, and it did. But with revisions in the seasonally adjusted data going all the way back to 2008 (as is normal), the changes in 2012 itself were relatively modest as the base rose. 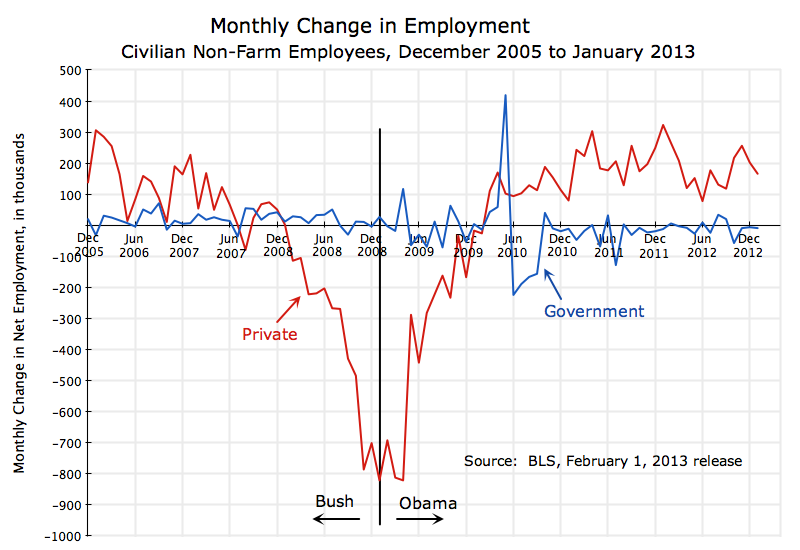 Under the earlier estimates, total non-farm employment growth in 2012 was estimated to have averaged 153,000 per month. Under the revised figures, employment is estimated to have grown at about 181,000 per month, for an increase of 28,000 per month. While an improvement, this still leaves monthly employment growth at less than the 200 to 250,000 per month that I had earlier noted in this blog would be needed to produce a steady and reasonably strong reduction in the unemployment rate. But it is at least closer to what is needed. And indeed, the unemployment rate from the separate Household Survey went up one notch to an estimated 7.9%, from 7.8% in December and November as well as September (it was an estimated 7.9% in October). While such a small increase in the January rate is not statistically significant in itself (the numbers are all based on surveys), one can certainly say that the unemployment rate has not improved since September. Like the Establishment Survey, the Household Survey that is used to calculate the unemployment rate (as well as labor participation and other figures) was revised to reflect new benchmarks and weights. But unlike the Establishment Survey numbers (used for the employment estimates), the Bureau of Labor Statistics does not then go back and revise the previous estimates stemming from the Household Survey. I do not know why. One cannot then directly compare the January figures to those of December and earlier, to see what the changes were. The BLS does, however, provide in a note the impact of the re-weighting on a few of the main estimates, including on the total number in the labor force, on those employed, and on those unemployed. Taking this impact into account, the figures indicate that the number in the labor force was about unchanged in the month, while those employed (based on the Household Survey) fell by 110,000, and those unemployed rose by 117,000. This is not good, and suggests that the unemployment rate rose (slightly) not because workers re-entered the labor force, but because workers lost jobs. But too much should not be read into one month’s figures, particularly when the figures suggested by the Household Survey (that employment declined) contradict the figures indicated in the Establishment Survey (that employment rose). Such contradictory moves in the month to month changes are not unusual between these two surveys, and the figures in the Establishment Survey are generally seen as more reliable for the total employment estimates. Private employment growth is therefore continuing, and is indeed continuing at a rate that is somewhat higher than had been estimated before. But total employment growth is being pulled down by continued cuts in government employment, and the overall rate of employment growth is not at what is needed to produce a steady and consistent decline in the rate of unemployment. Perhaps the best that can be said is that the estimated fall in GDP in the fourth quarter of 2012 (discussed in a post on this blog yesterday) does not appear to have led to a sharp reduction in employment growth — at least not yet.